Featured: Sombra Revealed At BlizzCon! It was expected, but we got a first look at Sombra in Overwatch! Here’s all the info! 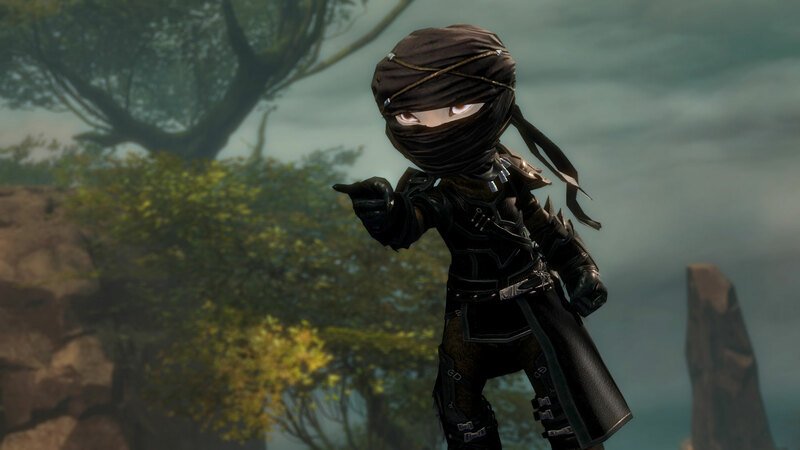 Now, as many of you know, Thief is my main profession in Guild Wars 2. Right now, Thief is in a sore spot having damage and mobility but not having enough survivability to use said damage in drawn out fights, troubles with condition damage and not enough sufficient party utility for raiding. I’m not saying as a Thief I should look at an opponent and they fall into down state. I’m saying after landing a decent burst combo and some auto attacks, my opponent better question fighting me for the next 15 seconds. 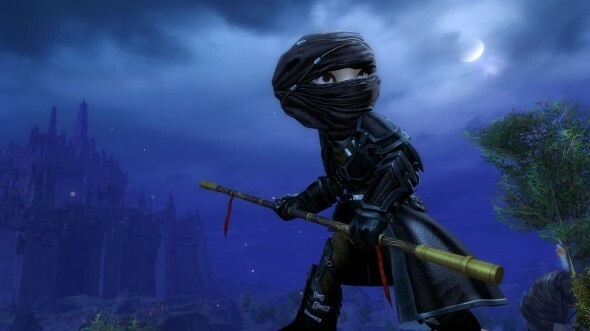 A step in the right direction for Thief was taken as ArenaNet gave us a preview of the January 26th balance changes for each profession. Alright where to start… how about Basilisk Venom (elite) gaining unblockable? This is pretty big for me as it will pierce through the assortment of blocks used these days. You can start a burst combo and can land it now. What’s good is that there is counter play to Basilisk Venom such as evading and I believe invulnerability as well. Withdraw (heal) FINALLY got it’s 10% healing increase which was promised so long ago and took forever for some reason. Bandit’s Defense (Daredevil utility skill) will block for the full duration & the kick knock down will be a flip over skill you can activate. I’ve been asking for this since HoT beta weekend 2. I assume it wasn’t in at HoT launch due to time constraints but it was a skill that just killed you more often than not due to the plethora of AoE you wanted to block but an enemy was in range so you auto kicked and ate damage. 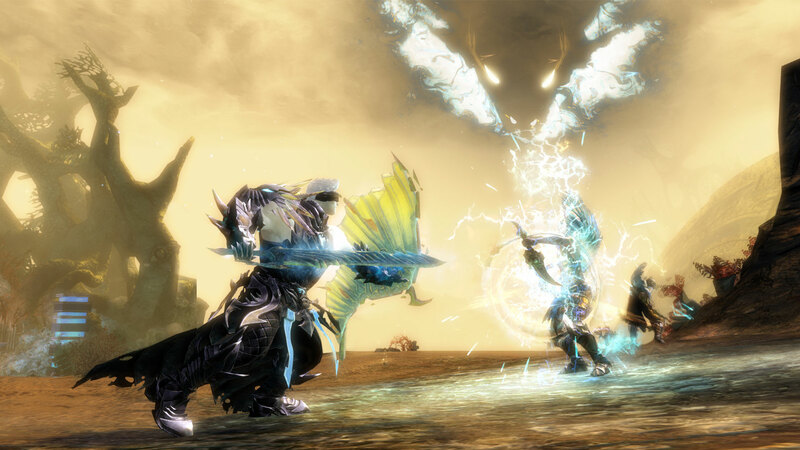 I know mace 4 on warrior has a similar block/flip over setup so I couldn’t see why ArenaNet couldn’t do it eventually. I’m just glad that it’s going to be in now and it could definitely can have a place on my utility bar. Black Powder (Pistol 5) aftercast removal is huge! D/P stealthing will be a lot smoother which will help for maxing stealth duration or when getting caught out. It helps with speeding up blinding bolt combos when combined with unload or whirling axe. On the flip side it does promote the use of D/P even more as it’s arguably the best weapon set for a thief. Thieves got some autoattack speed increases for Dagger and Sword for better sustain damage. Dagger I wasn’t so worried about but Sword is insanely better than it was. The Sword auto attack speed is one of the reason I didn’t use it. Now, I’m considering retrying it. The speed increase for sword results in about a 30% damage increase which is great. Both speed increases will help with sustain damage after bursting. Also, for some reason, staff is getting some damage increases. Not sure why or where to be quite honest; staff is pretty strong as a damage weapon as it is. I think the increases will be minimal at best. Acrobatics is also getting a revamp. The goal is to provide a regenerative feel; endurance regen and remove conditions more frequently. I’m worried about the traits or even the trait line not being worth picking due to really long cooldowns. An example is a new trait called Instant Reflex which used to be Fleet Shadow. Instant Reflex allows you to gain evasion for 2s when struck below the 50% health threshold on a 40s CD. I feel 40 CD is way too long. However I haven’t seen the all of the traits and the new Acrobatics line is still in development so I’ll wait to make a final say. I feel there still some things to look over on thief. Some of those are that I’d personally like preparedness (which is a Trickery minor trait that grants thieves +3 extra initiative) to be base line in order to allow Thieves to take something other than Trickery without losing out on the extra 3 initiative. I’d also like the Signet of Agility active to work as described which is “remove a condition FOR each ally near you”. Right now it removes a conditon ON each ally around you. Overall I am happy about the buffs and we’ll definitely see Thieves come back into play somewhat. I’m hoping that Thief doesn’t become a staple pick everyone feels like they need to go for to win in PvP. I do hope that these buffs brings the people who main thief back. Weakening Charge (Skill 2) – Feels waaaay better to use. Being a targeted skill makes it a bit spammable (don’t waste all your initiative on it) without charging away from your target. You can even use it to break away by simply un-targeting the enemy. The post beta notes signal they’re talking about making this skill have an additional role like extra conditions when you apply condition or receive less damage from weakened foes. I am all for the damage reduction. It’s what Daredevils really need; I don’t need more damage. But feel free to add that as well, I won’t complain. Debilitating Arc (Skill 3) – At first I thought this skill needed a slightly faster animation to telegraph evade properly due to striking then evading but I think it’ll be fine with practice. Dust Strike (Skill 4) – The cast time is way better but it still needs a smoke field or a dark field. The reason for this is that the staff is sorely lacking in the utility department. With a field, players can combo with it to blind with Weakening Charge and stealth or leech health with Vault or Bound dodge. I think staff would have a much better presence. I personally would go for a smoke field for the stealth since Daredevil still needs reprieves due to the thief’s innate sustain issues. Also, you can access the stealth attack, Hook strike, much more easily. Vault (Skill 5) – Feels better but I think the cast time needs to be shaved down a bit more (maybe 1/4 or 1/2 a second off) and it really needs an evade. Also, the distance traveled is shorter than stated (60o) but was fixed post-BWE3. Overall, staff is good damage-wise but is not good for competitive due to the lack of utility. I think the devs are looking into giving staff more utility and by proxy damage mitigation which is great. Channeled Vigor (Heal) – Can’t really say since the 3/4 channel change isn’t in. I think, when it’s finally in, it’ll be great and can compete with Withdraw. Heck, it might help a bit with thief’s sustain problems. Bandit’s Defense (Utility) – Still good even with the increased cooldown but the duration needs a slight increase. Also, this skill really, really needs a flip over for the kick followup; the kick needs to be optional. You can get caught out and die being locked in the kick animation like that. Distracting Daggers (Utility) – Equip time & velocity is fantastic now but I personally still won’t use it due to the internal cooldown for the next dagger use. I feel I should be able to freely use the 3 daggers once I equip them. Fist Flurry (Utility) – I like the skill and the idea of this skill rewarding you for landing all the hits for the flip over but I still think it’s too situational for decent reliable use. The cast time was reduce by 20% so the last hit gets in prior to 1 second so it might be worth checking out again. Impairing Daggers (Utility) – Had no problem with it in BWE2, no problem with it now. Impact Strike (Elite) – No problem with it but I do think that if you land the damage on an enemy you should be able to continue the chain. I read somewhere that stability stopped the chain so that might be a bug. I’ve seen people complain about not being able to hit this skill due to being CCed or something like that. Well it kind of makes sense. This is a very powerful elite, you can’t expect to drop 7-9k on someone and stomp them within 3 seconds and not have some kind of counter. Evasive Empowerment – I thought it was just me that thought 2s on this was short. I guess not as I’ve heard quite a bit from other thieves about this trait. Well it doesn’t really matter since this trait was recently turned into Havoc Master. This grants 7% additional damage to enemies within 360 range which is a solid reliable melee damage boost. Escapist’s Absolution – Right now, most if not all, thief mains take this trait due to being the only condition cleanse option without giving up a lot. The other master traits aren’t an option to take due to this. Right now the devs are looking to give Daredevil some damage mitigation which would greatly help. If enough damage mitigation is added, Daredevils could opt for something else in the master tier. If so, the talk on the forums of making this trait a minor would die down. Right now, I’d like it to be a minor to due the lack of good trait options of dealing with conditions without giving up something really valuable. Bounding Dodger (Damage Dodge) – Couldn’t really test this outside of dodge distance and damage. I think this was getting a fix from a blast to a leap finish if I recall? Also the dodge distance is the exact same distance to a dodge (I’ve personally checked) but feels a little short probably due to the animation. Bound dodge got updated post BWE3 to additionally grant 10% bonus physical damage for 4 seconds after dodging. Unhindered Combatant (Dash Dodge) – Fantastic, provides a lot and is very good for kiting with dual pistols. Dash dodge got updated post BWE3 to additionally grant 10% reduced physical & condition damage (it didn’t say in the notes but you can safely assume it for 4 seconds after dodging). Lotus Training (Condi Dodge) – Maybe due to the animation but I felt the dodge distance was a little short (similar to Bounding Dodger). It is the exact same distance as a dodge though (I’ve personally checked). 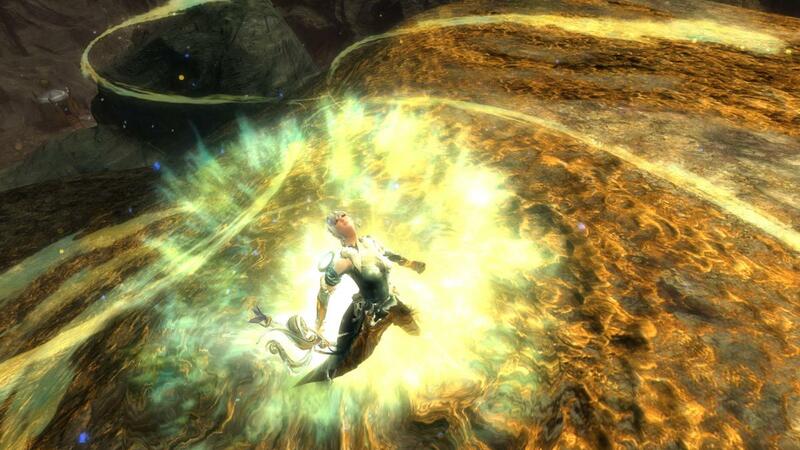 Lotus dodge got updated post BWE3 to additionally grant 10% bonus condition damage for 4 seconds after dodging. All these buffs to the dodges make me happy. There’s been talk from thief mains for a while now wanting the dodges as a selectable option in the Function bar (F3) therefore not making them Grandmaster traits; this would mean thieves would get three new Grandmaster traits to work with. The reasoning behind wanting this is because Daredevil doesn’t openly show a big difference in the combat UI like the other elite specs. This was one of the reasons I wanted this but also because the new Grandmaster traits could have helped with damage mitigation and sustain in general which the thief profession has problems with now. These buffs to the dodges show to me that the devs have no intention of separating the dodges as the Grandmaster traits. Before the buffs, maybe. Now it’d be way too strong to have these new dodges in addition to new Grandmaster traits. However, I can see from the post-BWE3 changes that the devs are working on improving the sustain issues. If that works out, I can live with what is currently available. Combining trait lines together with Daredevil I didn’t notice a significant difference with Daredevil and Acrobatics together. Maybe in a kiting build it’s more effective to see results. Deadly Arts, Critical Strikes and Trickery are good options to go with Daredevil. I read somewhere that Improvisation from the Deadly Arts line wasn’t working with Physical Skills though (possible bug?). The best combination I personally found was best was Deadly Arts, Trickery and Daredevil. This setup overall allows you to quickly spec to a different one (damage to conditions to kiting) and provide good damage options, steal upgrades and dodge mechanics. Daredevil does open the door to more viable builds. Dual pistol with Dash dodge makes you a kiting machine but can still get smacked up and will need something like dagger/pistol or shortbow for escapes; that’s the trade off for range and kiting. Double dagger with Lotus Training dodge makes for a great condition build; there’s a small window where you’re not dodging which you’ll probably have to spend in stealth. Damage build wise, Sword/Dagger and Sword/Pistol with Bound Dodger seems to be the way to go. The main problems with Daredevil are staff utility and sustain in fights. Alright well, that’s all for me. I highly doubt all the suggestions I made will go in; I am optimistic that the four points I mentioned above having a good chance. I won’t talk much about Daredevil changes after this because HoT will have launched! Hopefully the devs address the big issues in time. Also, I hope I find that PvP Staff Daredevil build that works for me. Thanks for reading and I’ll be flipping, dashing and dodging around you at launch! These are my general thoughts of the Thief elite specialization: the Daredevil! I was able to try out this elite specialization for the first time in the second beta weekend event for Guild Wars 2: Heart of Thorns! Since Thief is my main profession, I’ll be taking a hard look at this elite specialization. Staff Strike: this skill chains into Staff Bash and then Punishing Strikes which applies vulnerability. When stealthed you have access to Hook Strike for a single target knockdown auto attack. These skills are actually alright. They provide a good range for hitting multiple opponents and the damage output is quite decent. Weakening Charge: So this skill is a short range charge that does 3 strikes and applies weakness. I feel the range for this is a bit on the short end and it seems that this skill doesn’t act on target at times but charges in the direction you’re facing which is annoying when you want to get back into fights quickly. I’ve never really prioritized applying weakness before but this skill made me want to in order to reduce the damage I took. Debilitating Arc: this skill allows to to evade a short distance backwards and removes any immobilizing conditions. This skill is pretty decent, as it acts like a shorter ranged Withdraw without the heal. At first I thought the range was short but it is okay for quick disengages and you can assess whether to fight or flee. Dust Strike: you use your staff to sweep the ground in front of you, making a line of dust that blinds foes. I found myself using this the least due to the animation windup. The actual dust from this skill is transparent in fights so this skill needs an indicator or darker colors for visibility. I feel like this skill should have a target number of 5 due to it’s range of impact. Vault: Leap to a location dealing AoE damage on landing. The damage is great on this skill but the animation time is very clunky making it impractical to use in the middle of an sPvP fight. This skill needs a faster animation. One thing I’d like to note with melee staff that was bugging me all weekend, and I didn’t note this with melee staff on Revenant, is that the idle and running animations while holding a melee staff aren’t good in theory. The proper way to hold a staff is to have the head pointing forwards ready or strike or defend with your hands at the base of the weapon. When running, the staff I think should be held in a fashion which the user can perform a sweeping strike as if running into combat. Right now the staff is using the hammer animations which is fine for beta but I expect a more realistic melee staff stance down the road. The physical skills I feel like are more situational for the build you want to make. Channeled Vigor: The heal is quite good but requires you to be out of range of attacks to heal up properly and not get interrupted. This can be accomplished with Shadowstep or Vault. Bandit’s Defense: One of the best physical utility skills. This is a skill that blocks attacks for a second, knocking down anyone in melee range if blocked successfully. But that’s not all. This skill is a stun break on a 10 second cooldown. That is amazing. I have little to complain about this one. Distracting Daggers: A good skill in theory but suffers from interval cooldowns making it a non-pickup for me. It takes a second to equip the daggers and another second to equip another dagger after throwing one taking away from the active duration. I don’t mind waiting a second for the active but having an additional interval for throwing my daggers out is annoying. I would remove the interval or even make the entire skill instant cast on the activation and each dagger. The reason you’d want to use this skill is to on-the-spot interrupt an enemy’s skill or break a defiance bar. The intervals do not help with either. Fist Flurry: This skill sounds great in theory but difficult to execute in sPvP. You get a lot of hits in with this skill but you need to land everything to get access to Palm Strike which you also have to land to attach the Pulmonary Impact mark. Nothing wrong with the skill but it’s not worth the pick up unless you know you can hit every strike a majority of the time. I wouldn’t use it just because I already have damage output and would rather have utilities that help me survive. Impairing Daggers: A skill that I find is ideally good for single target burst builds. If this skill lands it immobilizes, slows and poisons. It’s a good follow up from landing Panic Strike. Impact Strike: This skill makes me feel dirty after using it. It’s a 3 hit combo that damages & dazes on the first hit, damages & knocks up on the second. The third strike does damage and finishes the enemy if it would put them into downstate or are already in down state. There are ways around this skill like stun breaking, blocking or blinking away but you have to be really fast about it. Maybe the damage on this skill needs to go down a bit. I like the idea of the skill but if you land the first hit you’re pretty much guaranteed to get the combo off. And I’ve seen this combo hit for around 8-9k health if the person couldn’t stun break it. Oh, and I’d like the finisher I’ve equipped to work with this skill. 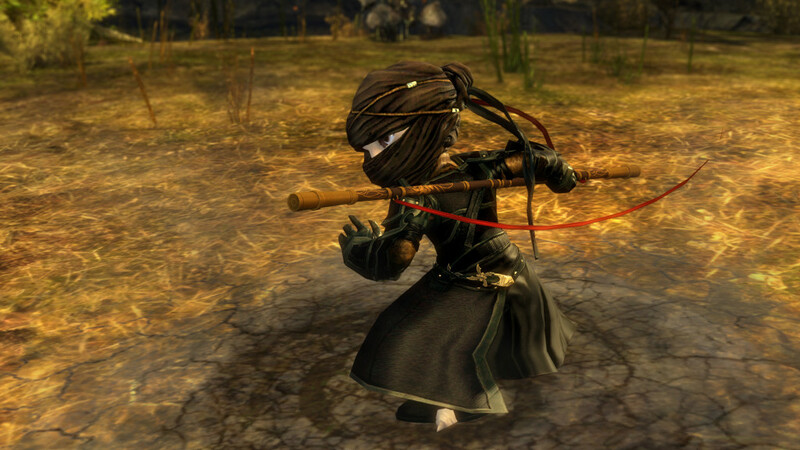 Lotus Training: This changes your dodge to fling daggers to nearby enemies causing bleeding, torment and cripple. This dodge is ideal for condition builds with Double Daggers. Unhindered Combatant: This changes your dodge to a long range dash that removes movement conditions (immobilize, cripple, chill) and grants swiftness. This is good for stealth oriented builds since you may want to dodge while invisible and you don’t want to accidentally reveal yourself by doing dodge damage. The problem with this dodge is the dash animation is odd. It seems to accelerate your running animation which feels odd to work with. A custom animation where the player literally lifts off the ground to dash would be much better and cleaner. Bounding Dodger: This essentially changes your dodge to a mini-Vault. This is the dodge you want for dodge damage builds and will probably be what the majority of players will pick come launch. The animation is a fraction of a second longer than a normal dodge so players will have to get used to that. With all this talk for dodging, the Daredevil specialization line naturally compliments dodging. There are traits revolving around staff and physical skills but the ones I want to focus on are Escapist’s Absolution and Impacting Disruption. Escapist’s Absolution removes a condition when you successfully evade. This used to be in the old Acrobatics line. Right now the best way to condition cleanse in PvP is to run Shadow Arts because Fleet of Foot (old dodge condi cleanse) was removed & Pain Response (in the current Acrobatics) is fairly decent for cleansing a few damaging conditions but has way too long of a recharge time to be worth picking up. Successfully dodging with Escapist’s Absolution removes one condition but I feel like with the strength conditions have these days this should be specific to damage oriented conditions at the very least. Thieves have a bunch of good ways to break out immobilizing effects; I don’t want to dodge and remove cripple when I want to remove the 7 stacks of burn on me. Maybe it’s okay to bring Fleet of Foot back in some form in place of Escapist’s Absolution; with a fair cooldown of course. Impacting Disruption is a great trait. This adds a Pulmonary Impact mark on players you interrupt and it has no cooldown. The one thing I forgot to mention is that Pulmonary Impact doesn’t have a visual cue for Daredevils (or their target) to know if the mark was applied. Some sort of icon in the conditions area or a mark above their head would be a nice addition. To conclude, the Daredevil is a fun specialization bringing back dodge combat for thieves. I feel a few tweaks with Staff (wielding and combat animations), some physical skills and the Dash dodge are in order. We’ll see what the next beta weekend brings for this elite specialization. Hello everyone! This post is to cover the changes in Beta Weekend Event 2 for Chronomancer, Dragonhunter, Reaper, Tempest, Berserker, Daredevil and the Revenant. I’ll also throw in a little Stronghold. I want to note that the new section of Verdant Brink players can get into has way more challenging monsters and good event chains which is great. Well, seeing Lord Far… I mean, Swordmaster Faren in a speedo in the middle of a monster infested jungle wasn’t planned but was an interesting twist as side story. Anyways, the enemies are much more challenging and annoying to deal with which is good because players have to actually try and watch their positioning in fights. Alright, now, onto the elite specializations! Chronomancer mostly got a balance in traits to reduce illusion spamming as it was a little too good (sorry mesmers). As I was fighting I definitely saw that I needed to work a bit more in order to summon illusions but it wasn’t to the point of being exceedingly hard. Also, Gravity Well (elite) was updated to pull every pulse which I found to be a nice change. Then I experienced it on the receiving end in Stronghold. Not a fun well to be in. Next up is Dragonhunter. There are more changes in the works but for this beta weekend event the virtues got an update, the longbow’s Symbol of Energy got a damage buff & traps and traits got buffs. The virtues feel good with the Spear of Justice range lining up with the longbow range and Wings of Resolve healing more. I still think the cast time for traps need to go down. I also think Heavy Light needs to be removed or reworked to be attached to a longbow skill besides basic attacks. 240 knock back doesn’t seem like much but it’s enough to knock an enemy out of AoE which is very annoying. No wait, Extremely. Annoying. Reaper, I thought was good, but now it’s really time to consider fearing the Reaper. They buffed pretty much everything: Greatsword payoffs are better, Reaper Shroud got tweaked and the shouts are stronger and have reduced or instant cast times. So I really have no complaints. One of my favorite changes to greatsword is that you can move while casting Nightfall (Greatsword 4) so you can move with your enemy in order to place the AoE blind properly. This allows you to land the rest of your skills successfully. Tempest overall got a damage buff to some warhorn skills and overloads. The 2 main issues is a range indicator for Overloads. I’d like to know the area which my Overload Air is affecting when I’m bring lighting down on enemies. The other issue is Overload water as I’m still not really seeing the big heal. Maybe everyone’s health is topped off when I get to that point, I’m not sure. Berserker is in a solid place. There’s definitely more damage options in the traits and rage skills and a clear view for condition damage that surrounds burning. I especially like Outrage since it’s a stun breaker on a really low cooldown. Torch is a pretty decent condition type of weapon, I can see it being used in PvP. The primal burst skills are all pretty decent, each providing an augmented version of the normal burst skills, most of them supplying fire. Since this is a new elite specialization, I’ll put out a post to describe my thoughts in more detail. Daredevil brings back the dodge combat that fell out of the thief meta via traits and the 3rd endurance bar. It does so in a way that it isn’t horribly to strong and still rewards skillful dodging. Staff is a decent weapon but it’s hard to say right now if it’ll be viable for sPvP at all skill levels. Bandit’s Defense and Impact Strike are great physical skills to take in most scenarios with the other physical skills being situational (based on the build). I think the damage on the Impact strike combo needs to go down a bit since the first two skills are hard crowd control and Impact Strike’s Finishing Blow kills a person when the damage from Finishing Blow would put them into down state. Again, since this is a new elite specialization, I’ll put out a post to describe my thoughts in more detail. Revenant I spent most of my time with Shiro, Jalis and Glint with Sword/Shield and Hammer. So I can’t really speak about any changes to Ventari, Mallyx and their associated weapons. Buff to sword and tweaks to Shiro were amazing. There’s still an issue using Unrelenting Assault on an enemy near a wall but the rest is pretty great. Shiro got some nice tweaks, especially to the heal; you can now proc the heal on attack much quicker. Now let’s talk Herald. Shield it really good. And I’m not saying that, it’s really good. The base heal on the skills make it a worthy option. To add on Envoy of Exuberance‘s (Shield 4) AoE protection you can grant to allies from a distance is great and the break bar on Crystal Hibernation (Shield 5) really helps with dealing with some binds. The utilities are fantastic to say the least. The healing skill can help you heal to full if getting bombarded with attacks. In fact all the utility actives are pretty decent, You have a stealth reveal, AoE damage/condition field, a facing damage swipe, and a channeled cone knock down. What’s cool about the Facet utility skills is that you can have 2 or 3 on at a single time which is great for preparing for a fight or simply running around. I mean, who doesn’t like perma swiftness? The Herald is meant to be a party support type but the specialization line can be customized to support you in combat or your allies around you. The first BWE I didn’t get a chance to get into stronghold because I was testing out the elite specializations. This time I actually spent quite a few games in Stronghold. So the opening strategy I like the best is sending one person to defend (preferably someone tanky), one or two to the enemy guards (DPS) and the rest to supply camp. From there you assess what to do next. Trebuchet is really good for the one defending because people don’t expect it and either come up to stop you or still try to take out guards which is much more in your favor. The strategy I saw in a few games is that people wrap around the backline in order to attack the enemy doorbreakers earlier. This works if no one is escorting. I don’t like it too much because you run a high risk of being seen by a lot of people before actually attacking the doorbreakers. I still find the map a bit snowball-y if a team gets a really good start due to the death timers being the same for the duration of a match. If a team is hard pushing for lord and fail, they don’t really get punished due to just reapplying pressure. There’s not enough time for the other team to mount a half decent offensive unless they have really mobile people. Thankfully, there’s overtime. Overtime is a cool mechanic. I only experienced it once and won because I cleaved someone to gain the 5 point lead before the timer ran out. And those are my thoughts from BWE1 into BWE2 and Stronghold. I’ll be making separate posts on Berserker and Daredevil. To summarize, Chronomancer is in a good spot, Dragonhunter still needs work, Reaper is in a good spot, Tempest is almost in a good spot, Berserker is solid but can use some tweaks, Daredevil need some tweaks, Revenant is looking pretty solid and Stronghold can be a bit snowball-y if your team mess up early; otherwise it’s a very fun PvP mode to play. I have been waiting literally months for this moment. This is the moment where I share the Thief elite specialization that’s coming in Heart of Thorns: The Daredevil. For those who don’t know, I main a Thief so I’m super hyped for this. Sorry this is coming out a little later than usual, I did a bit of theory crafting. 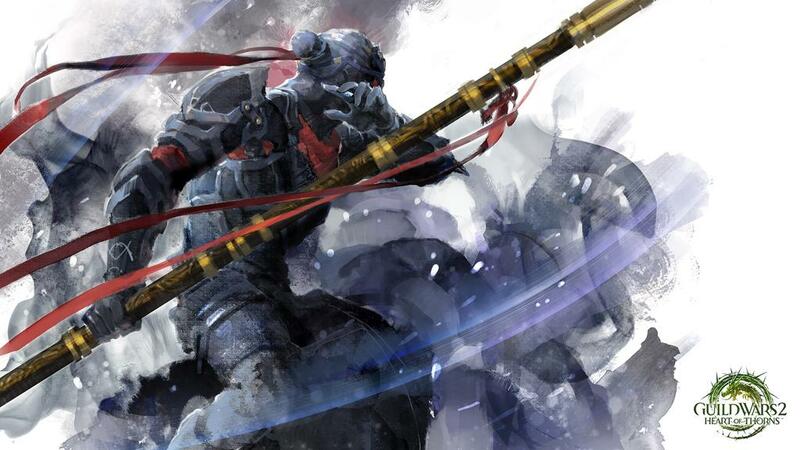 Game Designer Karl McLain released a blog post today giving us the lowdown on the Daredevil. Alright so rather than your F1-F4 skills changing into something different, this elite specialization grants you benefits to your dodge. Instead of two endurance bars, Daredevils will get 3 and the Grandmaster traits will give you an extra feature to add to your dodge; we’ll get to that later. – Channeled Vigor (Heal) – Channel to gain endurance and health per pulse. Gain more health if endurance is full. – Fist Flurry (Utility) – Strike an enemy multiple times. If all attacks hit, this skill turns into Palm Strike. Palm Strike strikes an enemy marking them with Pulmonary Impact. After a short duration this mark hits the enemy again for non-crit damage. – Distracting Daggers (Utility) – Equip daggers that can be thrown to daze and interrupt enemies. Interrupting a skill increases the recharge of the skill that was interrupted. – Impairing Daggers (Utility) – Throw daggers at a single enemy causing poison, slow and immobilize. – Elite Skill (Elite) – A 3 hit combo that finishes on the 3rd strike. 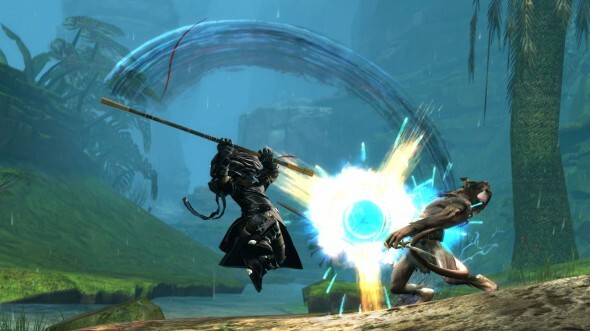 The first hit is Impact Strike that dazes on hit, the second hit is Uppercut that sends your foe flying into the air. The third strike is Finishing Blow sends a downward strike on your foe that finishes downed foes. Finally we have traits! Traits will focus on helping Daredevils stay in fights via dodge and hits. Minor Traits: Unlocks the elite specialization, gain endurance on steal and health on successful evades. – Evasive Empowerment: After dodge rolling, your next attack deals bonus damage. – Weakening Strikes: Cause weakness to enemies you critically hit. – Brawler’s Tenacity: Gain endurance when you first activate a physical skill. Physical skills have reduced cooldowns. – Staff Master: While wielding a staff, gain endurance for each initiative point spent. Deal bonus damage when your endurance is not full while wielding a staff. – Escapist’s Absolution: Remove a condition when you successfully evade an attack. – Impacting Disruption: Enemies that you interrupt suffer a Pulmonary Impact. After a few moments, Pulmonary Impact delivers a massive blow to your foe. – Lotus Training: Your dodge changes to Impaling Lotus. 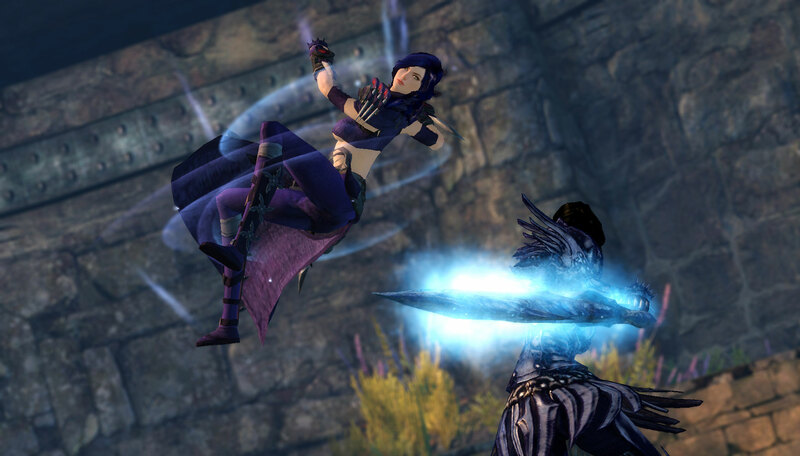 While in combat, each dodge you use will throw daggers that bleed, torment, and cripple enemies. Additionally, this dodge functions as a whirl finisher. – Bounding Dodger: Your dodge changes to Bound, which gives you the ability to leap in a direction, dealing crushing damage at the location where you land. This dodge ability also functions as a leap finisher. – Unhindered Combatant: Your dodge ability changes to Dash, which removes cripple and chill effects from you and increases the distance you dodge. Oh man, there’s quite a bit I have to say about this. First off, this is where the rest of the Acrobatics line (with the introduction of specializations a few months back) went. This elite specialization works very well with Acrobatics both lines being dodge-based. The traits have various options that I’m excited to try out. The Master traits might be a toss up if you go dodge condi cleanse or stealth condi cleanse. Grandmaster traits have the three dodge options that all sound interesting and will be fun to experiment with each one. The staff skills seem pretty great, re-positioning you for increased damage potential. It will be interesting to see what this will be paired up with. For PvE and WvW I’d imagine shortbow for range damage but for PvP this could vary if the staff provides enough mobility to swap shortbow out for something else. The physical skills are really good. The ones I especially like are Bandit Defense for the blocks while stomping or running towards a ranged enemy, Distracting daggers for stopping stomps and interrupting from afar. The elite is very good and is really strong but I need to see it to determine if it’s OP or not. 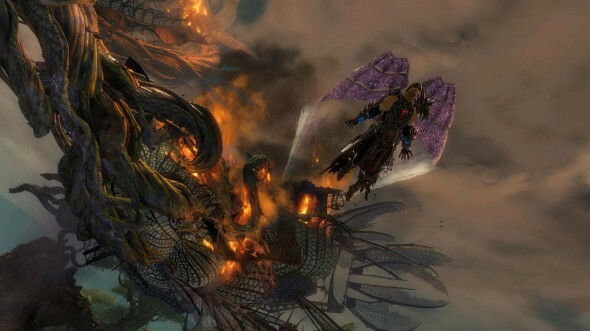 We’ll find out on Points of Interest tomorrow on Friday August 28th at noon Pacific on the Guild Wars 2 Twitch channel!